Glass backsplash tiles are out of my budget, but that didn’t stop me from installing my own glass tile backsplash. In fact, my installation covers an entire wall measuring 8 feet by 6 feet, and it only cost me a little over $20. “How?” you want to know. I made my own “glass tiles” and did my own backsplash installation out of a bunch of small Italian tiles bought at an estate sale. 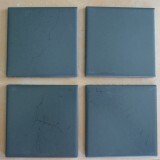 The tiles I bought were a deep gray with pewter veining. The finish was matte-to-satin with very little sheen. Not at all like glass. So I added two different finishes to the tiles. Some of the tiles got a pewter finish. For this I used ceramic pewter paint and rubbed it on the tiles with my fingers, then baked the tiles in the over to seal the finish. For the glass look, I waited until I was done with the backsplash installation (ok, it is a little more than a backsplash! 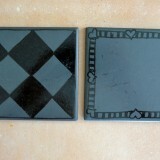 ), then painted random tiles with a high-gloss tile glaze. I added at least three coats of this high-gloss glaze, allowing the glaze to dry completely between coats. 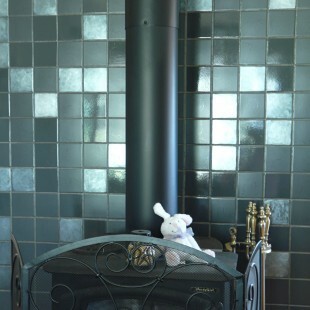 The end result was a huge varigated glass backsplash that elegantly camouflaged our drab wood stove–which was the original intent. So go forth and make your own glass tiles and come back to show the rest of us your results. 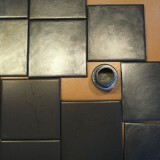 Iam so excited about this, I love to do tile and this just opens another world for me, thank you! The results from this project are stunning! I really wanted a glass backsplash in the kitchen but I can’t afford the tiles either. I’m wondering what I can use around here to make something spectacular. This post definitely has my gears turning. I daren’t go over to your blog today or my head will explode with more ideas!